Sarah Mangold is the author of Household Mechanics (New Issues, selected by C. D. Wright) and the forthcoming Electrical Theories of Femininity (Pavement Saw, Transcontinental Poetry Award). Her most recent chapbooks include An Antenna Called the Body (Little Red Leaves, Textile Editions), I Meant To Be Transparent (forthcoming Little Red Leaves e/editions), and the newly-released Cupcake Royale (above/ground press). She has been awarded residencies at the Djerassi Resident Artists Program, The MacDowell Colony, and The Virginia Center for the Creative Arts as well as an Individual Artist Award from the Seattle Arts Commission. 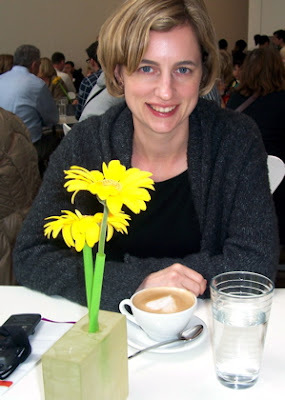 From 2000-2009 she edited Bird Dog, a print journal of innovative writing and art and currently co-edits, FLASH + CARD, a poetry chapbook and ephemera press. My first book, Household Mechanics, is a shortened version of my MFA thesis so it felt very validating to have the work accepted in the larger world. And, to have it selected by one of my favorite poets, C. D. Wright, was an even bigger ego boost. More about my first book experience at Every Other Day with Kate Greenstreet. My current work is perhaps more “themey” around a central topic (technology/transmission of messages) which relates to my current reading interests but also seems like a logical progression. I was one of those kids who always wrote, stories, poems, plays, whatever. In college I studied fiction writing and poetry but eventually poetry won out after one too many discussions with fiction teachers about why “nothing happened” in my stories. It’s a slow process. I usually write in response to something I’m reading. Write, write, write in a journal for a month or so and then go back through and pick out the interesting sounding things to type up. I wait a couple weeks and then go back with fresh eyes to the typed up version and do another reduction, then I start working on a shape. I usually sketch ideas for the physical shape of the poem in the margins. The process takes awhile, months, sometimes years. Short pieces which morph into a longer project—usually a sustained reading over a couple years around a particular idea. At least so far it has worked that way. I am a very nervous reader, I probably stopped playing the cello (see below) because of the panic of performing but….I love listening to readings/talks I haven’t been able to attend. Addicted to Penn Sound and the Naropa Archives. I enjoy the social aspects of reading, meeting people interested in writing etc and I also appreciate the extra attention it requires of the work—the rethinking of timing and breath, how it will really work when saying it out loud to an audience. I haven’t really worked with an outside editor outside of school but am currently working with David Baratier of Pavement Saw Press to edit my new book and it’s wonderful. He is a really good line editor and noticed many things I missed or sort of knew were off and we were able to make the poems tighter. I have an office job and carpool with my husband into work. His day starts earlier than mine so I spend about an hour every morning in a coffee shop near my office writing. On the weekends we both go to a local donut/coffee shop to read/write for a couple hours. Barbara Guest, Beverly Dahlen, George Oppen, Lorine Neidecker, Joan Retallack, and for times of total despair, Michael Palmer’s Sun. Clinique’s Aromatics, my mom’s perfume. All of the above. I always listen to music while writing, lots of song lyric fragments in my poems. People who make me say YES! Burning Deck, Little Red Leaves, Fact-Simile, Chax, Litmus, anyone with a small press, everyone involved in Portland’s Spare Room Collective reading series and the (now defunct) Seattle Subtext Collective, David Wolach’s PRESS activities at Evergreen College, the instructors and poets I worked with at San Francisco State. I’d like to be home enough to have a dog. Our cat might have a different opinion about that. Cellist—I did both equally into my mid-20s. I stopped playing the cello for a year and I was ok; I stopped writing for a year and it wasn’t ok—that’s how I decided. I don’t think I had a choice—writing was always there and once I found out you could actually go to school to study creative writing I was hooked. Greatness is tricky—I’m reading the new and old Joan Didion, pretty great. And I saw the new Muppet Movie, also great if great = happiness. I’m working on the final edits for my new book, Electrical Theories of Femininity, out next Fall from Pavement Saw. My newest work appears to be headed away from the technological cyborg and into the creation of monster.